The large N2000 site “coastal areas at the Flensburg fjord” include marine and coastal areas at the Baltic sea east of Flensburg until the peninsula Geltinger Birk. 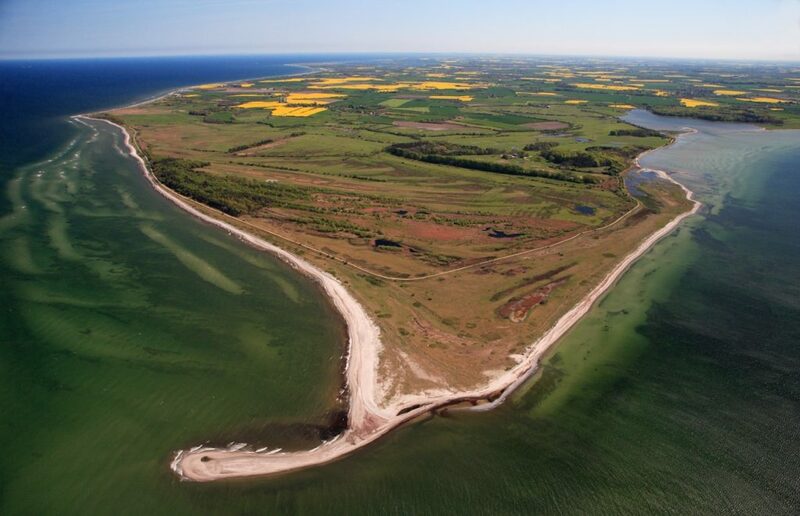 Three subsites with importance for amphibian and reptile protection were selected to be developed during the LIFE-project: Geltinger Birk, beachwall landscape Bockholmwik and Holnis peninsula. The biggest subsite with over 600 ha is Geltinger Birk, which was in the 19th century a lagoon landscape with full influence of the Baltic Sea. Diking and pump draining were the measures to improve agricultural use on former areas of lagoons and wet salt meadows. After land purchase during the last 30 years nature conservation was able to reestablish with controlled water management: brackish lagoons, salt meadows, wet meadows, coastal heath, reed beds and grazed woodlands. At shores of the Baltic Sea a typical dune and beach wall landscape is part of the grazing project at Geltinger Birk. At the subsites Holnis and Bockholmwik similar coastal habitat complexes occur and additionally coastal cliffs. The coastal areas with wet and dry semi-natural habitats are important for rare and endangered species as e.g. natterjack toad, sand lizard, Large white-faced darter or as breeding and resting sites for birds. At the subsites Geltinger Birk, Holnis und Bockholmwik it is planned during the SemiAquaticLife-Projekts to create new ponds, to restore ponds for natterjack toads or Large white-faced darter and to develop suitable bare ground patches as land habitat for natterjack toads and sand lizard. The sand lizard will be reintroduced from inland habitats since the species became extinct in coastal habitats in the region.